Get caffeinated for a day of shopping on Calgary’s original Main Street. 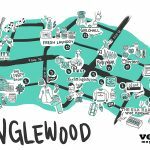 Established in 1875, Inglewood has gone through many iterations — the latest being a shopping, dining and live music venue destination for people craving local businesses keeping things a little weird. Grab an Americano or latte and one of the killer breakfast sandwiches at Gravity to start your epic day of shopping. Inglewood is chock full of locally owned shops, so it’s only fitting you start the day at this local mainstay. Pop by in the evening for some cheese and wine and to take in some live entertainment, which they book regularly. From there, cut over to The Livery to check out the super cool converted barn space operated by two of Calgary’s fashion juggernauts, Camp Brand Goods and CoutuKitsch. Not only can you shop their perfectly Canadian adventure apparel and jewellery, you can peruse the amazing selection of lifestyle products, including Herbivore Botanicals body care, Stanley flasks, of-the-moment cookbooks and Compartés chocolate bars. If you’re at all in the market for high-end menswear, check out North American Quality Purveyors (NAQP). There isn’t a dud in the mix here, with its selection of selvedge denim, classic footwear and bags, classic knits, shirts and everything in between. Most items are made in Canada or the United States, but recently, Japanese lines such as Anonymouslsm and Iron Heart have been brought in. Head back to 9th Avenue SE and check out Purr. It’s a one-stop shop for men’s and women’s clothing, including a great selection of candles and home accessories. But it’s the kids’ section that will make your heart skip a beat. You’ll lament the fact you never had a duvet cover that made you look like you’re wearing a fairy princess gown to bed, or a dollhouse for a family of vintage bunnies with an unrivalled lifestyle. Pop into Kent of Inglewood to get totally lost in their old-school selection of shaving creams and shaving accessories, colognes, barware, knives, axes and just about anything related to grooming and outdoor adventure. Allow yourself a few minutes to test out the creams and concoctions and spritz colognes from some of the world’s best fragrance houses such as Floris, D.R. Harris, Czech and Speake and Truefitt and Hill. If all the perfect hairdos in the room are making you feel like a slob, sit down for a cut and shave at the in-house barbershop. Cross over to The Uncommons, a store devoted to selling unique clothing, homewares, art and accessories you might not find anywhere else in town. The owners are always on the lookout for new lines to stock, but there’s always a solid collection of local art, off-kilter accessories from Calgary-based Fairgoods, clothing from Province of Canada, Lochside bikes and apothecary items from Blackbird Ballard, Duke Cannon and Imperial barber products. Now that you look and smell like a million bucks, it’s time to get a little dirty at Plant. Just try not to walk out of here without one of their awesome terrariums or houseplants. If you have a black thumb, don’t worry, there are plenty of other things to buy, including stationery, ceramics, bedding, art and various other knick-knacks. Venture deeper into the store and you might find a pop-up shop from a local vendor. Pinch yourself — no, you’re not in Portland. Mini cactus in tow, dip into Silk Road Spice Merchant to stand in amazement at their selection of super-fresh spices from all over the world. Peruse their great selection of cookbooks to find your next dinner or baking project and then pick up a few bottles of hard-to-find spices and spice blends (basically, if you need it, they probably have it). You’re probably out of coffee by now, so duck into Rosso and order the matcha latte. It’s creamy and sweet and grassy, and a totally new level of caffeination you need to try. 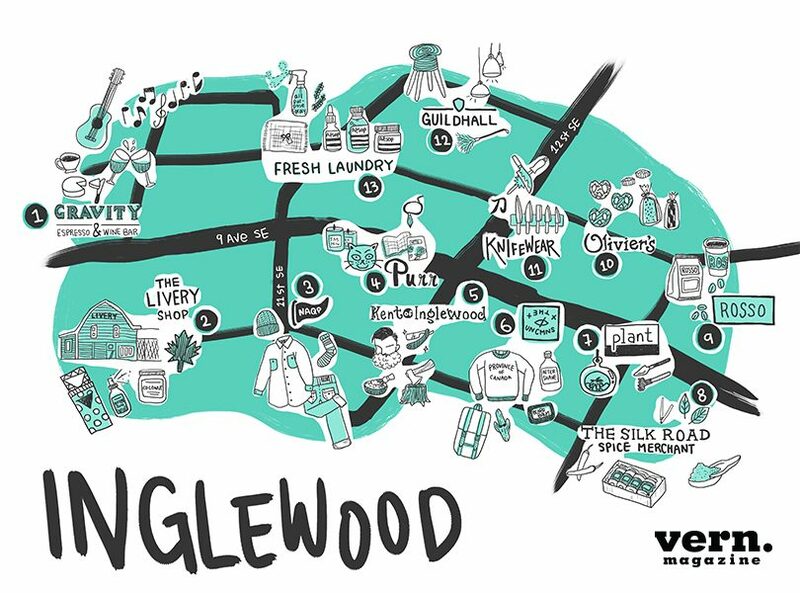 Take a seat at the communal sofa and nibble on one of the delish sandwiches, then head out to the final leg of your Inglewood shopping extravaganza. Save room for dessert at Olivier’s. They’re been in business since 1909 years and pump out such confections as chocolate covered licorice, crazy-addictive coconut brittle and Caramellows (chocolate-covered marshmallows so good you’ll want to pack them for lunch the next day). If that recipe from Silk Road you want to try out requires some next-level mise en place, buy a next-level knife from Knifewear. You’ll be overwhelmed by the vast selection, but not to worry, the staff is super knowledgeable and focused on education rather than selling, and they’ll probably let you slice through lots of tomatoes. Satisfy your decor addiction at Guildhall Home. With a mix of classic design from Scandinavian lines such as Hem, Iitala, Menu, Norman Copenhagen and Umbra Shift, there’s plenty to covet. Take a step closer to your cleanliness-is-next-to-godliness mantra with Guildhall’s amazing selection of high-end Bürstenhaus Redecker cleaning tools like the ostrich-feather duster and just about any type of brush you can imagine. End your shopping trip at Fresh Laundry, where you can test out the amazing selection of apothecary products. They’re the only place in Calgary that sells Aesop, the ultimate organic skincare line (and the ultimate bottles to leave out on your counter to impress friends). This store also carries other lines of skin care such as Herbivore as well as textiles from Fog Linen and cleaning products from Common Good.